We manufacture excellent quality range of durable and long-lasting Dining Furniture for our clients spread across the globe. Designed to perfection, these dining tables and chairs have smooth edges and fine finish. Available in different designs and dimensions as per the client's specifications, we offer it at industry leading prices. 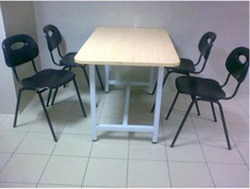 Our range comprises of 4 seat dining table, 2 seat dining table, 5 seat dining table, black dining furniture etc. Keeping in mind current market requirements, we are offering our clients a broad array of Dining Furniture that is classy in design and will definitely grab compliments. 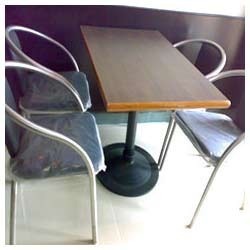 We use quality tested raw material coupled with the latest techniques, these dining furnitures are manufactured in strict compliance with the defined industry norms by our skilled professionals. Furthermore, the entire range is designed in a wide spectrum of designs, colors and patterns to meet different choices of our clients. 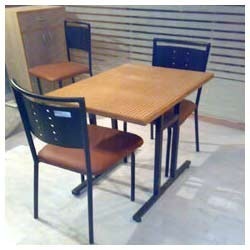 We have gained immense expertise in manufacturing and supplying Dining Sets. These are available at affordable rates to our esteemed buyers. 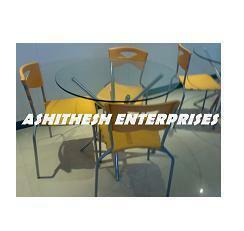 We are an eminent name, which is engaged in delivering Red Dining Furniture at clients'' premises. The offered range is manufactured utilizing high grade raw material and innovative technology in complete adherence with the international quality norms. Along with this, the offered range is suitably checked on different characteristics to maintain its authenticity throughout the designing process. We offer to our clients a wide range of Stainless Steel Dining Tables, which are available in different sizes, shapes, designs & material, meeting the application demands of end-users. 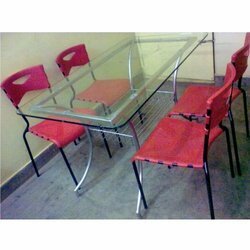 We are a highly acclaimed name in manufacturing and supplying of Stainless Steel Dining Table with Attached Steel. 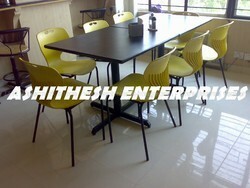 Our customers can avail Dining Table and Chairs from us. The offered range of dining chair is designed utilizing optimum grade raw material. 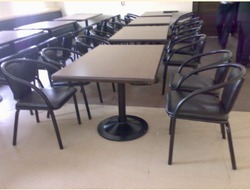 Our organization holds expertise in offering Stainless Steel Dining Furniture to our clients. Some of notable attributes of these Stainless Steel Dining Furniture are appealing appearance, ecstatic pattern and charming color combinations. 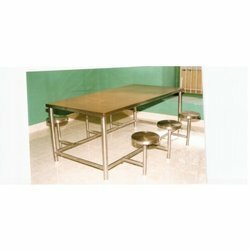 These Stainless Steel Dining Furniture are distinct from similar range of Stainless Steel Dining Furniture available in market and have superior finish. These Stainless Steel Dining Furniture are quite beautiful and would enhance appearance of your dining rooms. We are a leading name in manufacturing and supplying high quality 4 Seater Dining Table Set. These are available as per buyer requirements at affordable prices. We cater to inquiries mainly from South India Only. 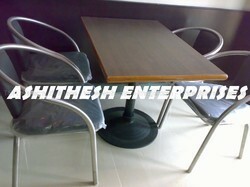 We specialize in offering 2 Seat Dining Table with metal back rest & seat cushion for our clients spread across the globe. Comfortable to sit on and perfect in finish these tables are available in various patterns and colors. 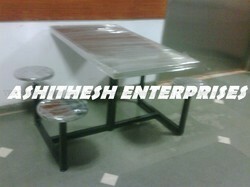 We are able to gain immense expertise in delivering Glass Top Table with Chairs to our clients. 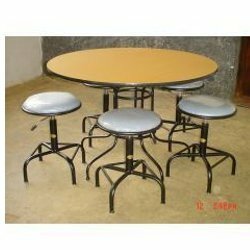 Our company holds immense experience in this domain and is involved in offering wide assortment of 5 Seater Dining Table. Looking for Dining Table And Chairs ?